Fitness Equipment Market size is set to exceed USD 14 billion by 2024; according to a new research report by Global Market Insights, Inc.
Increasing geriatric population across the globe and the need to eliminate health problems in them is creating several opportunities for the fitness equipment market demand. To address these requirements, a rapid development is observed in the establishment of health and fitness clubs globally. As a result, the consumption of exercise machines in such infrastructures is further driving the market growth. Additionally, the growing awareness about physical fitness to eliminate harmful impacts of environmental problems, such as respiratory and heart diseases, accelerates the consumption of fitness machines. The rising adoption of smartphones & connected devices that manage the customers’ exercising patterns and daily performance drives the industry growth. Moreover, the advancements of health clubs that deploy smart performance tracking machinery and huge discount packages attract more customer subscriptions resulting in the industry development. Several governmental policies in countries including the U.S., India, and others to support the expansion of healthcare facilities and fitness infrastructures that include loans with low interest rates are creating fitness equipment market growth opportunities. Home fitness equipment market is predicted to witness developments over the forecast timespan due to the increasing deployment of these machines in residential settings. A transition in the living standard of consumers and increased spending on maintaining a healthy lifestyle support the inclination toward using fitness machinery. Furthermore, public and societal gyms in modern housing societies and government infrastructures accelerate the product demand. Additionally, the trend of hiring personal fitness trainers who offer customized training services create opportunities for home segment expansion. Commonly used machines in the residential settings are treadmills, elliptical machines, kettlebells, and weights that aid easy exercising and provide high outputs to consumers. 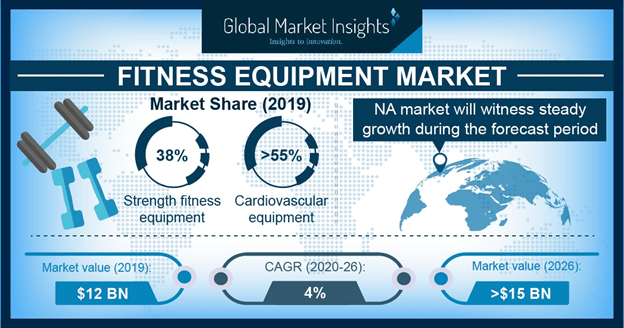 The Europe fitness equipment market is expected to grow rapidly over the coming years due to increased consumer awareness about health & fitness in countries including Germany, Italy, and others. Rising issues of obesity and heart diseases in the European countries create the need for these products. Additionally, the increasing penetration of private and public health clubs in the region accelerates the market demand. The U.S. market is experiencing high growth due to flexible government policies and programs for spreading awareness related to the physical fitness activities. The Asia Pacific fitness equipment market is witnessing substantial expansion due to the incorporation of new technologies and machines across all industry verticals in countries including China, Japan, and India. Increasing disposable income in the region and penetration of companies based in the U.S. account for growing consumer awareness about the latest technologies. The presence of a major manufacturing sector across the countries including South Korea, China, and Japan is adding up to the production and consumption of various machines. The major fitness machine manufacturers have developed dealership networks in the region to cater to the local health clubs, corporates, and residential consumers. The key players in the market include HOIST Fitness Systems, Johnson Health Tech, Amer Sports, Fitness EM, Brunswick Corporation, True Fitness, and Technogym S.p.A. These companies adopt new product development & innovation strategies that include connected and IoT-based machines. They develop several long-term contracts and partnerships with dealers across the operational regions to cover local markets. For instance, Precor, a business unit of Amer Sports, announced a two-year agreement with Planet Fitness, a vendor of commercial fitness machines.